It is the soldier, who salutes the flag, who serves beneath the flag, and whose coffin is draped by the flag, who allows the protester to burn the flag." Charles L. Ingelston, Sr, 91 of Memphis, passed away at James Square October 1st 2013. Philippines. Charles was a member of VFW Post 369 in Mexico, New York and was Post Commander 1950-1951. Surviving are his wife Evelyn, daughters, Charlene Blake, Stella Crandall and Michele Fuller, sons, Tracey, Chris and Ronnie, stepdaughters, Michele Mazzeo and Kim Kramer, sister Betty Hutchins, brothers Donald, Arthur and John, grandchildren and great grandchildren. Services are October 28th at Martville cemetary, Martville, NY. MEXICO - After celebrating his 81st Independence Day, my grandfather, Thomas R. Fisher, retired Army sergeant first class (SFC), left this world and his family behind early Friday morning. Tom met my grandmother, Sofie, while stationed in Germany and brought her home to the United States to begin our family. He served in both Korea and Vietnam, while raising a family of four, moving them from Georgia, Alaska, Germany, Colorado and Pennsylvania, and then finally settling in Mexico, where the family began planting our roots. Tom owned many businesses after retiring from the Army, including New Haven Mobile Homes, Fisher's Towing, Bulk Water Delivery and Aquatic Weed Harvesting. I've lowered our flag to half-staff in honor of his life and service to our country, so others may appreciate the gift my grandfather and countless others have given us, to live free in the home of the brave. He was predeceased by his oldest daughter, Barbara Haines. He is survived by his wife of 57 years, Sofie; a daughter, Peggy (Scott) Corbett; two sons, Bob (Betsy) Fisher and Steven (Vickie) Fisher; and seven grandchildren: Matthew, Kristen, Tim, Aaron, Sarah, Brett and Ashley. Funeral services will be held Tuesday at 11 a.m. at the Harter Funeral Home, 9 Washington Ave., Mexico. Burial will be in Vermillion Cemetery, with full military honors. Calling hours at the funeral home will be 4-7 p.m. Monday. Contributions may be made to the Mexico VFW, 5930 Scenic Ave., Mexico, NY 13114. Frank Sharp Sr., 87, of Mexico, died Saturday at the Oswego Hospital surrounded by his family. He was born in Syracuse, son of the late Floyd and Ethel Hanzen Sharp. He was a draftsman for Nestles of Fulton. He was a WWII Marine Corps veteran serving in the 5th Marine Division, 3rd Battalion, 13th Marines and served in Iwo Jima. He was a member of the Mattydale VFW Post #3146, and the Edick-Hamlink Post #369 VFW Mexico, NY. His wife, of 62 years, Palma, died in 2010.ter Funeral Home, 9 Washington Ave., Mexico, NY. Surviving are his children, Mary Ann (Frank) Netti, Jo Anne Ryan, Frank (Nanette) Sharp Jr.; daughter-in-law, Janet (Mark) Mandy; grandchildren, Antoinette (John) Richer, Colleen (Mike) Long, Christine (Douglas) Volkmer, Michael (Natalie) Netti, Jeffrey Sharp, Jayme Sager, Jayson Sager, Chelsea Ryan, Cierra Ryan; great-grandchildren, Danielle, Michelle, Dylan, Paige, Kian, Chance, Frankie, Lana, Owen. Albert W. Marino, 64, of Mexico, died Saturday at the VA Medical Center, Syracuse, NY. He was born in Fulton, the son of the late Bernard and Sally Davis Marino. He was an Army veteran, serving from 1969-1971. He was a member of the Edick-Hamlink Post #369 VFW, Mexico, NY. He attended the Mexico Methodist Church. He was a 34-year employee of Nestle's of Fulton in quality control. He later worked at Wal-Mart. He is survived by his wife of 37 years, the former Carol Howard; one son, Bill (Michelle) Marino of Liverpool; one daughter, Sally (Bill) Warren of Mexico; and five grandchildren, Kaitlyn, Dylan, Angelina, Lauren and Michael. Funeral services will be 11 a.m. Thursday from Harter Funeral Home, 9 Washington Ave., Mexico, NY. Burial will be in Mexico Village Cemetery. Calling hours will be 4 to 7 p.m. Wednesday at the funeral home. Contributions may be made to the family. Donald L. "Jack" Marsden, 86, of Mexico, died Sunday April 22, 2012 at the Veterans Administration Hospital, Syracuse, NY. He was born in Mexico, son of the late Loren and Hazel Moot Marsden. 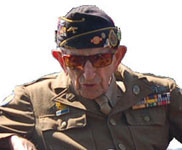 He was a U.S. Army veteran, serving in WWII with the 79th Lorraine Cross Division. He served at the Utah Beach Invasion, the Battle of the Bulge and the Battle thru the Ardennes. He was awarded the Purple Heart, a Bronze Star and five battle stars. He was a 67-year member of the Edick-Hamlink Post #369, VFW Mexico, NY. He retired in 1970 as a heavy equipment operator for the town of Mexico. He was a member of the North Mexico Methodist Church. Surviving are his wife of 65 years, the former Edith Shoup; one son, Russell (Charlene) Marsden, Mexico; two daughters, Johanne (Tommy) Phelps, Florida, Karen (Richard) Brown, Mexico; eight grandchildren; 17 great-grandchildren; two sisters, Leona Marsden, Mexico, Lona Piquet, Mexico; several cousins, nieces and nephews. Funeral services will be 1 p.m. Friday from the Harter Funeral Home, 9 Washington Ave., Mexico, NY with Rev. Karen Green officiating. Burial with full military honors will be in South Richland Cemetery. Calling hours will be 10 a.m. to 1 p.m. Friday at the funeral home prior to the service. April 5, 2012 Neil G. "Old Hickory" Duell, 92, of New Haven, died Thursday at St. Luke's Health Services in Oswego. He was a staff sergeant in the Air Corps during WWII, from 1940-1945. Neil was a 67year Life member of VFW Post 369 in Mexico and also an active life member of American Legion Post 1532 and the New Haven Fire Department. He was co-owner of A.C. Duell and Sons Lumber Mill in Demster. He volunteered throughout the years to stock the streams of Oswego County with fish for the D.E.C. Survived by his wife of 63 years, Nanette Lindsley Duell of New Haven; two daughters, Cheryl Coker and Jacqueline Lilly; a son, Robert Duell; a sister, Gloria Dimon; eight grandchildren; two great-grandchildren; and several nieces and nephews. A memorial service will be held 3 p.m. Wednesday, April 25, at the New Haven Congregational Church. A calling hour will be held from 2 to 3 p.m., prior to the service. Harter Funeral Home, Mexico, has arrangements.